Where do I start! I come from a sporting background in that I captained all of my sports teams at secondary school, represented my borough in cross country running, played for professional football clubs such as Leyton Orient and finished my football career playing semi professional football. You get the idea! I think sport was bred into me as my dad was a professional table tennis player, representing England for a number of years. I also have a small claim to fame in that I went to the same school as both David Beckham and Harry Kane, two England football captains! The day finally came when I needed to get a job.I started my career at a Promotional Marketing agency called Grass Roots Consumer promotions, then had a brief stint within the Property Industry, then into the Charity sector working for the Princess Alice Hospice within their retail department, and then into the fun world of the Automotive Industry, specifically fleet management. I came across The Chat Shop when I was looking for my next opportunity on LinkedIn. I was looking for an Account Manager position; the AM role at The Chat Shop came up as a recommendation based on my previous experience! A match made in heaven from the get go. The Chat Shop ticked every box for what I was looking for professionally and personally. I wanted to join a company who were young, ambitious and had an entrepreneurial mindset, just like me! (cheesy right). I had a really good feeling from the beginning, the fact that I saw table football in the office when I interviewed had absolutely nothing to do with it! I feel like I have worked here for ages, although I have only been at the company for four weeks. From day one the team welcomed me in and I never felt like “the new guy”, which is really nice. Everyone here are genuine friends with each other and that really shows through, there is a real sense of family within the company. The role itself is interesting and totally new to me, which is very exciting! 3. 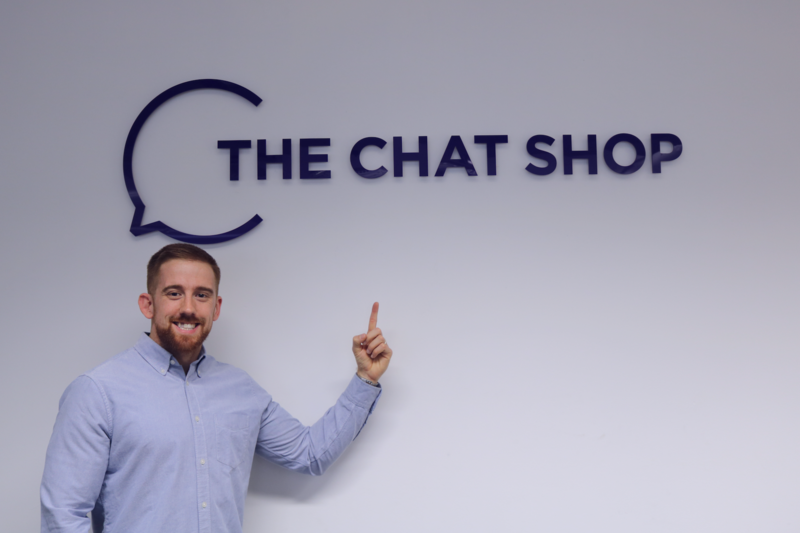 What do you want to accomplish at The Chat Shop? I would say to grow professionally, learn as much about the industry as I can and from the people around me. I am someone who always wants to be the best at whatever I do, so I want to make sure that I am providing the best service possible to our clients. I want my clients to know that they are in safe hands with me as their Account Manager and make sure that our relationships are built on trust. 4. What have you learned from your career before The Chat Shop that you’re bringing to the team now? Having worked in various industries has meant that I have learnt how to adapt to various situations and people. This really helps when managing accounts as no two account is the same. You have to be able to adapt in business! Also, one of the best pieces of advice I have ever been given is, “the moment you stop listening, is the moment you stop learning”, so I try to listen as much as I can. 5. What do you do for fun outside of work? I love the gym! Being fit and healthy is something that is really important to me, it’s a huge part of my life. I suppose you could put me in the category of a “weekend warrior” in the sense that I don’t specifically train for anything, but I love it regardless. Reading is something that I also enjoy and I make a conscious effort to read as much as I can, knowledge is power and all that! I am currently reading Richard Branson’s Autobiography – Losing my Virginity, which I highly recommend.